Gloria Caputo Lanza was a loving mother, devoted wife, consummate homemaker, master bridge player, talented pianist and singer, as well as a legendary home cook. 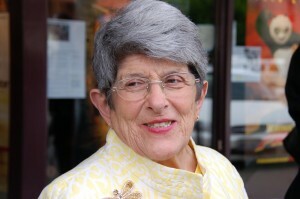 Gloria was born in Spokane, Washington in 1923 to Italian immigrants, Marietta and Anthony Caputo. She graduated from Holy Names Academy of Spokaneand attended Spokane Falls Community College. Growing up cooking with master cooks from Italy, Gloria learned classic techniques from her mother, aunts and cousins. Every dinner was s a true masterpiece; everything was homemade, including the pastas, which were rolled out meticulously by hand. She married Joseph J. Lanza, a prominent attorney, and moved to Seattle where they raised their eight children in the Seward Park area. They were active members of theSt. Edwards Parish, the Italian Club and The Washington Athletic Club. Joe was a master gardener and Gloria the master chef who took the beautiful vegetables grown in their garden and made them into something delicious. “Farm to Table” cooking was her culinary credo long before it became a fashionable phrase. Following the death of her husband, Gloria moved to Port Townsend in 2004 to be near her children who own Lanza’s Italian restaurant. She became an active member of the community and a vital part of Lanza’s, baking her infamous Italian Wedding Cake (now known as Gloria’s cake), helping with the flowers and greeting guests. Gloria was a gifted cook and gracious hostess. She welcomed and fed everyone, whether celebrating family reunions, hydroplane race get-togethers, bridge parties, poolside gatherings or birthday festivities. She is greatly missed by her large family and numerous friends since her passing in January, 2012. Her beautiful spirit lives on, especially when we all cook her recipes and savor her delicious food.